I remember back in 2011 when I’ve first used YARA. I was working as a security analyst on an incident response (IR) team, doing a lot of intrusion detection, forensics and malware analysis. YARA joined the tool set of the team with the purpose to enhance preliminary malware static analysis of portable executable (PE) files. Details from the PE header, imports and strings derived from the analysis resulted in YARA rules and shared within the team. It was considerably faster to check new malware samples against the rule repository when compared to lookup analysis reports. 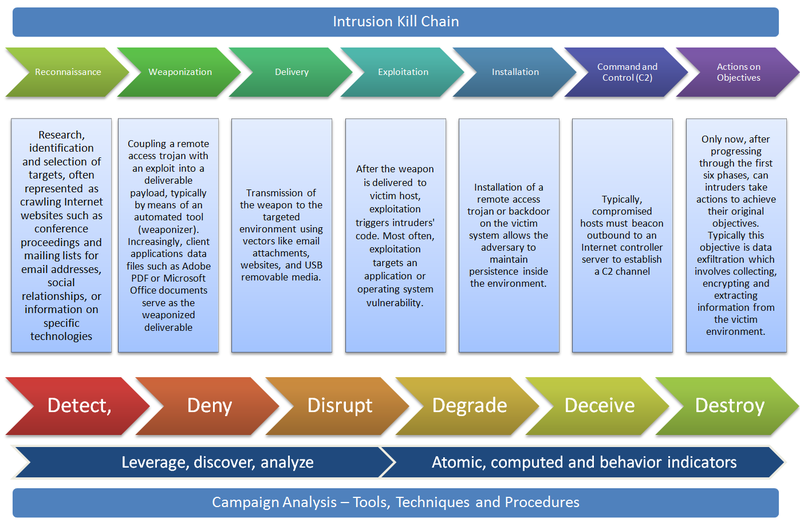 Back then concepts like the kill chain, indicator of compromise (IOC) and threat intelligence where still at its dawn. The lexical simplicity of a rule and its boolean logic makes it a perfect IOC. In fact ever since 2011 the number of security vendors supporting YARA rules is increasing, meaning that the tool is no longer limited to the analyst laptop. It is now featured in malware sandboxes, honey-clients, forensic tools and network security appliances (2). Moreover, with the growing security community adopting YARA format to share IOCs, one can easily foresee a wider adoption of the format in the cyber defence arena. In the meantime YARA became a feature rich scanner, particularly with the integration of modules. In essence modules enable very fine grained scanning while maintaining the rule readability. For example the PE module, specially crafted for handling Windows executable files, one can create a rule that will match a given PE section name. Similarly, the Hash module allows the creation on hashes (i.e. MD5) based on portions of a file, say for example a section of a PE file. So how does exactly a tool like YARA integrate in the incident response team? Perhaps the most obvious answer is to develop and use YARA rules when performing malware static analysis, after all this is when the binary file is dissected, disassembled and understood. This gives you the chance to cross-reference the sample with previous analysis, thus saving time in case of a positive match, and creating new rules with the details extracted from the analysis. While there is nothing wrong with this approach, it is still focused on a very specific stage of the incident response. Moreover, if you don’t perform malware analysis you might end up opting to rule out YARA from your tool set. Lets look at the SPAM analysis use case. If your team analyses suspicious email messages as part of their IR process, there is great chance for you to stumble across documents featuring malicious macros or websites redirecting to exploit kits. A popular tool to analyse suspicious Microsoft Office documents Tools is olevba.py, part of the oletools package (3), it features YARA when parsing OLE embedded objects in order to identify malware campaigns (read more about it here). When dealing with exploit kits, thug (4), a popular low-interaction honey-client that emulates a web browser, also features YARA for exploit kit family identification. In both cases YARA rule interchanging between the IR teams greatly enhances both triage and analysis of SPAM. Another use case worth mentioning is forensics. Volatility, a popular memory forensics tool, supports YARA scanning (5) in order to pinpoint suspicious artefacts like processes, files, registry keys or mutexes. Traditionally YARA rules created to parse memory file objects benefit from a wider range of observables when compared to a static file rules, which need to deal with packers and cryptors. On the network forensics counterpart, yaraPcap (6), uses YARA for scan network captures (PCAP) files. Like in the SPAM analysis use case, forensic analysts will be in advantage when using YARA rules to leverage the analysis. Finally, another noteworthy use case is endpoint scanning. That’s right, YARA scanning at the client computer. Since YARA scanning engine is multi-platform, it poses no problems to use Linux developed signatures on a Windows operating system. The only problem one needs to tackle is on how to distribute the scan engine, pull the rules and push the positive matches to a central location. Hipara, a host intrusion prevention system developed in C, is able to perform YARA file based scans and report results back to a central server (7). Another solution would be to develop an executable python script featuring the YARA module along with REST libraries for pull/push operations. The process have been documented, including conceptual code, in the SANS paper “Intelligence-Driven Incident Response with YARA” (read it here). This use case stands as the closing of the circle in IOC development, since it enters the realm of live IR, delivering and important advantage in the identification of advanced threats. The key point lies in the ability for the IR teams to introduce the procedures for YARA rule creation and use. Tier 1 analysts should be instructed on how to use YARA to enhance incident triage, provide rule feedback, concerning false positives, and fine tuning to Tier 2 analyst. Additionally a repository should be created in order to centralize the rules and ensure the use of up-to-date rules. Last but not least teams should also agree on the rule naming scheme, preferably reflecting the taxonomy used for IR. These are some of the key steps for integrating YARA in the IR process, and to prepare teams for the IOC sharing process. Malware analysis is a interesting topic nowadays. It requires a fairly broad of knowledge and practical experience across different subjects. My background is in systems and infrastructure which means I am more confident with the dynamic analysis methodology than the static analysis one. Some of the readers have similar background. However, if you are willing to roll your sleeves and spend time in order to learn and be proficient with the different tools and techniques static analysis can done – hopefully will write about basic static analysis in a near future. Additionally is intellectually challenging. 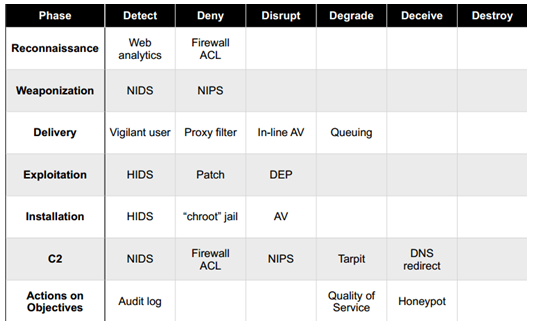 What are the malware capabilities? What is the worst it can do? Which indicators of compromise (IOC) could be used identify this malware in motion (network), at rest (file system) or in use (memory)? – These IOCs can then be used across our defense systems and in our incident response actions. The process consists of executing the malware specimen in a safe, secure, isolated and controlled environment.The dynamic analysis methodology allows you to determine the malware behavior and how it interacts with the network, file system, registry and others. In this post I go trough a technique to determine its behaviour at the network level. In this way we can start answering the previous questions. A simple and effective manner to execute malware analysis in an safe, isolated and controlled fashion would be to use a second hand laptop with enough RAM and fast I/O like a SSD drive. Then on top of it a virtualization software. My personal preferences goes VMware Workstation due to the wide range of operating systems supported, and affordable price. Essentially two virtual machines. One machine running the resourceful and multi-purpose REMnux v5. For those who don’t know, REMnux is a fantastic toolkit based on Ubuntu created by Lenny Zeltser that provides an enormous amount of tools preinstalled to perform static and dynamic malware analysis. The tools installed have the ability to analyze Windows and Linux malware variants. You can download it from either as a Live CD or a preconfigured virtual appliance for Vmware or VirtualBox from here. The second machine will be running Windows XP or 7 32 Bits. That will get you started. Then configure the environment and install the required tools on the disposable – relying heavily on VMware snapshots – Windows machine. In the first technique, I want REMnux to act as gateway, dns server and proxy – including SSL – . This will allow us to intercept all network communications originating from the infected machine. The following picture illustrates the methodology for dynamic analysis. The illustration should be self-explanatory. In this manner, any DNS request made by the infected machine will be redirected to the REMnux. If the malware is not using DNS but using hardcoded IP addresses, the requests will go through the default gateway which is pointing to the REMnux. The REMnux by its turn will have iptables configured to redirect all received traffic either on port TCP 80 or 443 to TCP port 8080. 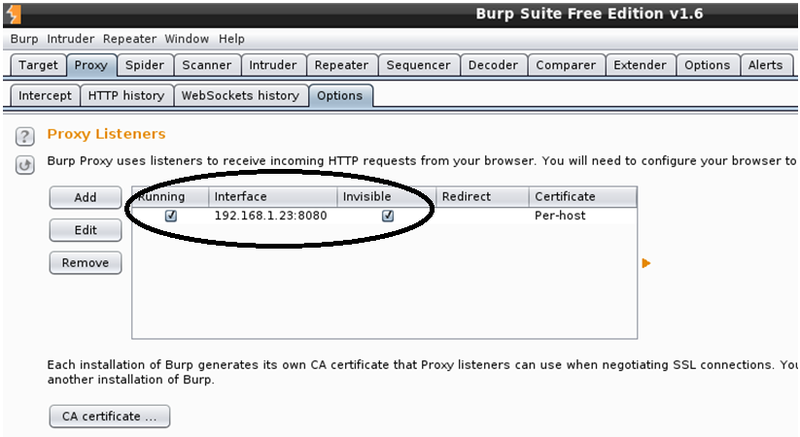 On this port – TCP 8080 – Burp Suite is listening as a transparent Proxy. In this way you will have visibility and control into all network communications initiated by the infected machine. 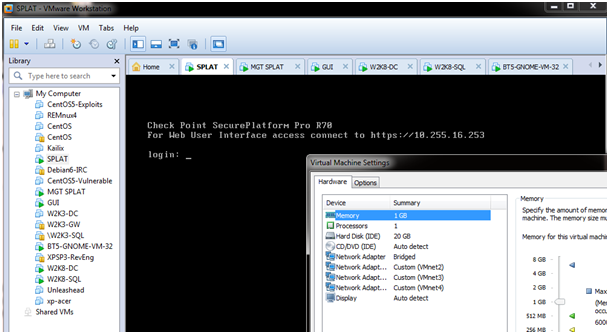 Define the Network adapter settings on VMware Workstation to be in a custom virtual networkg., VMnet5. Start FakeDNS to answer any DNS requests. Start HTTP daemon to answer HTTP requests. Redirect HTTP and HTTPS traffic to port TCP 8080 by configuring redirect rules via iptables. Optionally you run tcpdump to capture all the networking traffic (allows you to create IDS signatures). Define the Network adapter settings in the VMware to be in the same custom virtual network as the REMnux. The traffic is Intercept by Burp Suite and can be seen and manipulated in clear. The request can be forwarded to localhost on port 80 to fake an answer. Following the first request, this malware performs a second request, potentially sending some more data. Unfortunately the request is encrypted – that would be a good challenge for static analysis! As you could see in a quick manner you could determine that the malware tries to reach out to a C&C. This type of knowledge can then be used to find other compromised systems and start your incident response actions. You might see this as a time-intensive process that does not scale – think a company that needs to analyse hundreds of samples per month, week or per day – solution is automation. Several automated malware analysis system have appeared over the last years such as CWSandbox, Norman Sandbox, Anubis, Cuckoo and others. Essentially these systems load the malicious binary into a virtual machine and execute it. During execution all the interactions with I/O, memory, registry and network are tracked and then a report is produced. This greatly reduces the costs of malware analysis. However, is good to understand how to do manual analysis because many times the malware samples only trigger on specific conditions or bypasses the sandboxes. In addition you start to be proficient on different tools and techniques! Back in March 2011, Eric Hutchins, Michael Cloppert and Dr. Rohan Amin from Lockheed Martin (US Gov defense contractor) released a paper named Intelligence Driven Computer Network Defense Informed by Analysis of Adversary Campaigns and Intrusion Kill Chains. This was a great contribution to the IT security community because it describes a novel way to deal with intrusions. They claim that current tools and models that deal with intrusions need to evolve mainly due to two things. First network defense tools focus on the vulnerability component of the risk instead of the threat. Second the traditional way of doing incident response happens after a successful intrusion. To solve this problem they propose a model that leverages an understanding about the tools and techniques used by the attackers creating intelligence that is then used to decrease the likelihood success of an intrusion. In order to understanding the threat actors , their tools and techniques they adopted models and terms that have origins in the US military. Essentially they propose to maps the steps taken by attackers during an intrusion. These steps are then intersected with a chain of events with the goal to detect, mitigate and respond to intrusions based on the knowledge of the threat using indicators, patterns and behaviors that are conducted during the course of action of the intrusion. Atomic – Atomic indicators are attributes relevant in the context of the intrusion and cannot be further divided into smaller parts. Examples include IP addresses, email addresses, DNS names. Computed – Computed indicators are digital representation of data pertinent to the intrusion or patterns indentified with regular expressions. Examples include hashes from malicious files, regular expressions used on IDS. “Reconnaissance : Research, identification and selection of targets, often represented as crawling Internet websites such as conference proceedings and mailing lists for email addresses, social relationships, or information on specific technologies. Weaponization : Coupling a remote access trojan with an exploit into a deliverable payload, typically by means of an automated tool (weaponizer). Increasingly, client applications data files such as Adobe PDF or Microsoft Office documents serve as the weaponized deliverable. Delivery : Transmission of the weapon to the targeted environment using vectors like email attachments, websites, and USB removable media. Exploitation : After the weapon is delivered to victim host, exploitation triggers intruders’ code. Most often, exploitation targets an application or operating system vulnerability, but it could also more simple exploit the users themselves or leverage an operating system feature that auto-executes. Installation : Installation of a remote access trojan or backdoor on the victim system allows the adversary to maintain persistence inside the environment. Command and Control (C2) : Typically, compromised hosts must beacon outbound to an Internet controller server to establish a C2 channel. Then these steps are used to produce a course of action matrix that is modeled against a system that is used, once again, in military language as offensive information operations with the aim to detect, deny, disrupt, degrade, deceive and destroy. The goal is to create a plan that degrades the attacker ability to perform his steps and forcing him to be reactive by interfering with the chain of events. This will slow the attackers movements, disrupt their decision cycles and will increase the costs to be successful. The following picture taken from the original paper illustrates the course of action matrix. This model is a novel way to deal with intrusions by moving from the traditional reactive way to a more proactive system based on intelligence gathered trough indicators that are observed trough out the phases. 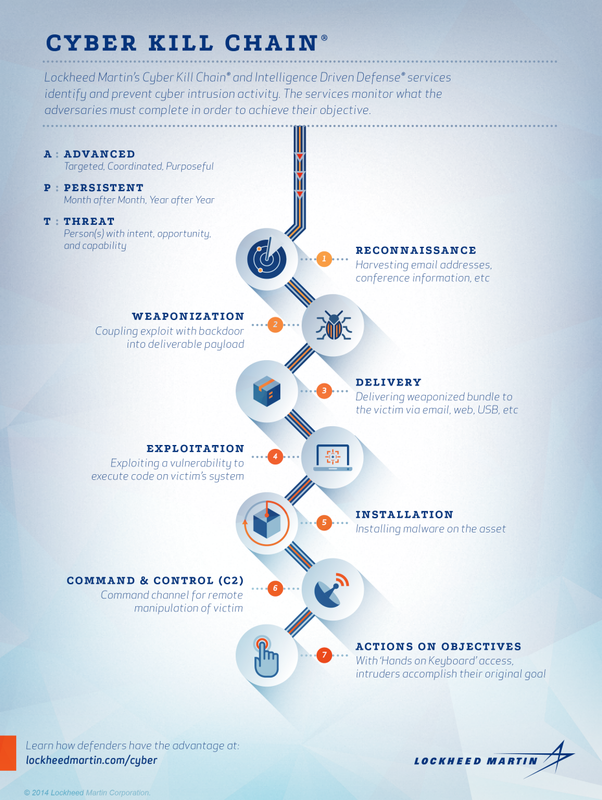 Normally the incident response process starts after the exploit phase putting defenders in a disadvantage position. With this method defenders should be able to move their actions and analysis up to the kill chain and interfere with the attackers actions. The authors go even further to a more strategic level by stating that intruders reuse tools and infrastructure and they can be profiled based on the indicators. By leveraging this intelligence defenders can analyze and map multiple intrusion kill chains over time and understanding commonalties and overlapping indicators. This will result in a structural way to analyze intrusions. By repeating this process one can characterize intruders activity by determine the tactics, techniques and procedures on how the attackers operate i.e., perform a campaign analysis. Following the identification phase of the incident handling process, where among others you have identified malicious acts or deviations from the normal operation. It comes the containment phase. During the containment phase you want to stop the damage. Stop the bleeding and pause the attacker in the most quick and effective manner without changing evidence and using a low profile approach. There isn’t a silver bullet on how to do containment because every case is unique however there are some strategies that you can use. Some examples of short term containment include disconnecting the network cable, redirecting the impacted system DNS name to another IP address, creating a firewall rule or if your infrastructure allows put the system into a separated isolated vlan. During this process engage the business owners and decide the best approach. Do not gracefully shutdown the system because it will destroy important evidence, artifacts and you will lose all your volatile data. There are times that the incident handler is also gathering evidence to deliver to the forensics team or the incident handler also does the forensics analysis. Depending on the case you might be working, you might see an overlap between incident handling and forensics but the processes and procedures go hand in hand. 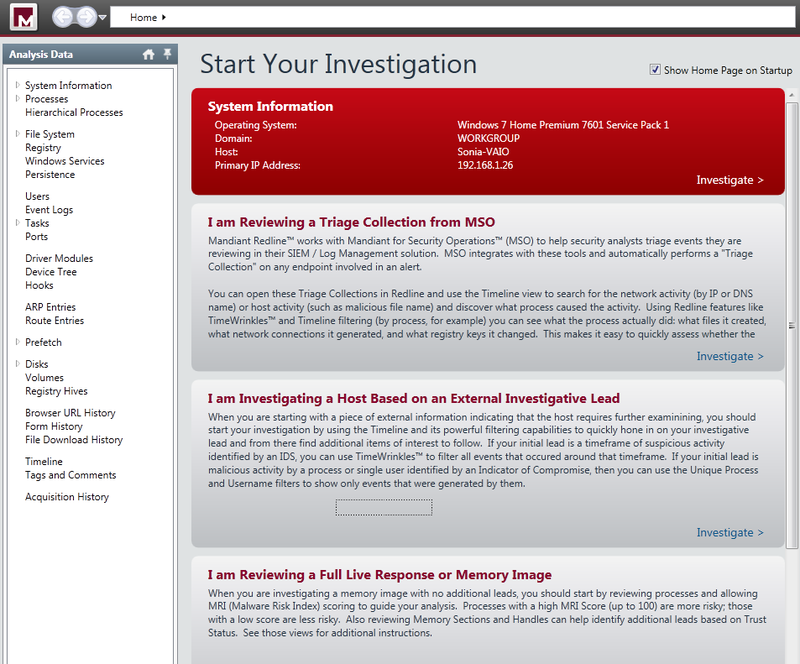 From a forensics perspective do a forensics image of the affected system. This means gathering the file system using a disk imaging process and a memory dump (volatile data). You should start by gathering the volatile data, then you do a disk image. With these elements you can do a thoroughly analysis of the data. During the forensics data analysis, among other things, you will look at the file system at bit level, analyzing several artifacts such as program execution, files download, file opening and creation, usb and drive usage, account usage, browser usage, etc. Create a forensic image of the disk as soon as is practical. Make sure you use blank media in a pristine state to create a copy of the impacted system. This blank media e.g, usb hard drive, should be wiped. You clean and prepare the drive during the preparation phase. You do not want to be wiping drives while going under fire! To do the disk image you should do a bit-by-bit image using your preferred toolkit. Don’t use the tools from the compromised system because you cannot trust them. Use binaries from a another source. One example is the linux based toolkit Helix that brings the dd tool built in that will assist you doing the forensic image of the hard drive – Helix product went commercial but you can still download the free 2009R3 version – . Once you created the image and ensure its integrity, is good practice to record the time and the evidence creation method including the image hash on your incident handler notebook. If times allow create more than one image. Most of the times you don’t have time because a image creation can take several hours to execute. In such case you do a duplicate offsite and then you do your analysis using the duplicate. Image creation is a simple task but you need to practice it. To do the image creation of the hard drives the traditional way is to remove the hard drive from the impacted system and create a forensic image using a write block. But other times this method is not practical. Another way of making a forensic image of the hard drive is to use live acquisition methods, boot disk acquisition or using remote/enterprise grade tools. A live system acquisition might be useful in cases the affected drive is encrypted or you have a RAID across multiple drives or is not feasible to power down the machine. However, this method will only grab the logical part of the hard drive i.e. partitions such as FAT, NTFS, EXT2, etc. 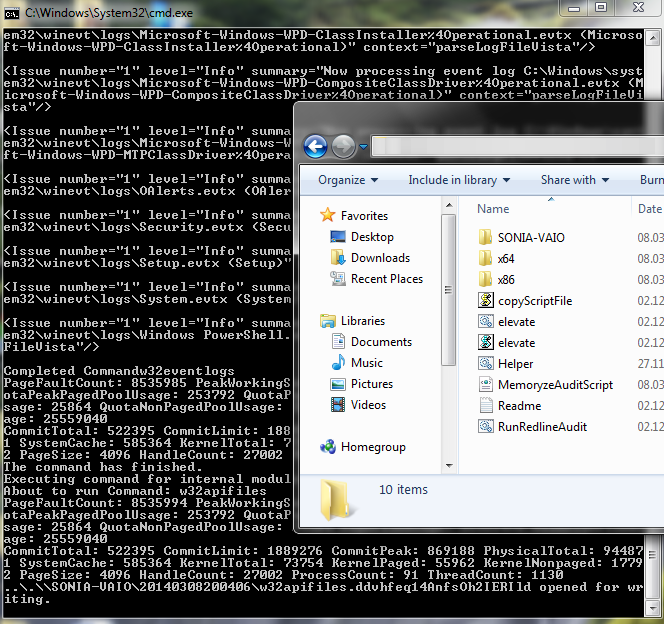 The other method is using a bootable forensic distro such as Helix. You need to reboot the system and boot the system using CD/USB. This allows to create a bit-by-bit image of the physical drive, the evidence on the drive is not altered during boot process and you can create an image of the hard drive into a image file. This image file can then be used across different analysis tools and is easier to backup. Let’s look at an hands-on scenario to create a forensic image using a bootable disk method from a compromised or suspicious system using dd. Dd is simple and flexible tool that is launched using the command line and is available for Windows and Linux. In this case we will run dd in a Linux system. What dd does is only copying chunks of raw data from one input source to an output destination. It does not know nothing about partitions or file systems. dd reads from its input source into blocks (512 bytes of data by default) specified by the if= suffix. It then writes the data to an output destination using the of= suffix. We start by using dd to prepare a target hard drive. We will wipe the data of an hard drive that we will be using to gather the evidence. We will use dd to zeroize an 320Gb USB drive. This will render the drive sterile and into a pristine state. Plug the USB drive into a Linux system and execute fdisk -lu to display available drives on the system. In this case we have 2 drives. One is the /dev/sda which is the internal hard drive of the system and the /dev/sdb which is the 320Gb drive that we plugged into the system. The /dev/sdb does not contain any valid partitions and this is ok for now because we only want to wipe it. Next execute dd specifying as input the special file /dev/zero and the /dev/sdb as the output drive by using a block size of 8k to increase the speed of the process. This will create zeros across the entire drive. Be careful with this command and make sure you are wiping the right drive. On our system this process took more than 3 hours to complete. The “No space left on device” error is normal. Also note that the number of records in and out multiplied by the block size (8192) will get you the number of bytes copied. To confirm that the drive has been zeroized you can dump the contents using xxd. We have now prepared our media for the acquisition process. Now that we have pristine media we can do our forensic image. Boot the Helix CD on the target/compromised system and plug the USB media. Then create a EXT2 file system using fdisk and mke2fs. Building a new DOS disklabel with disk identifier 0x7b441f7a. The number of cylinders for this disk is set to 38913. The fdisk created a partition that used the entire disk and the mk2fs created the file system (note the command run on /dev/sdb1). Finally with the fdisk -lu you could confirm that the partition was formated using with an EXT2. The next step is mount the file system by creating a mount point and then mounting the partition. Then we are ready to start our bit-by-bit image creation. This method will gather the allocated space, unallocated space and slack space, bad blocks. This means will grab the all the sectors from the hard drive from the MBR to the final sector including the Host Protected Area (HPA) if it exists. Start by creating a cryptographic fingerprint of the original disk using MD5. This will be used to verify the integrity of the duplicate. Then using dd with the input source being the /dev/sda and the output file a file named suspect.img. Other usefull options is the conv=sync,noerror to avoid stopping the image creation when founding an unreadable sector. If such sector is found with this option, it will skip over the unreadable section (noerror) and pad the output (sync). Finally create the fingerprint of the image created and verify that both fingerprints match and unmount the drive. The creation of the image is a simple process but you should practice it. Under fire is much harder to accomplish these type of activity. Also it is a process that can take several hours to accomplish. In our case took around 90m. The integrity checking took around the same time. With these steps we created a forensically sound image of an hard drive in a bit-by-bit manner and we ensured its integrity. How did the attacker gain entry? What is the latest evidence of attacker activity? What actions did the attacker execute on the system? How did the attacker maintained access to the environment? What tools has the attacker deployed? What accounts did the attacker compromise? Following the identification phase of the incident handling process, where among others you have identified malicious acts or deviations from the normal operation. It comes the containment phase. This is the third stage of responding to computer incidents. Trough this step, one of the things we do is a initial analysis of the compromised system by taking a low profile approach. Is also where we capture the relevant data from the system – in forensics terms this step is where you preserve digital evidence.. Normally we would do a forensics image of the affected system for further analysis. One thing that should be part of our forensics image is the file system (disk imaging) and a memory dump (volatile data). One of tools that can help incident handlers looking at the memory/volatile data for further forensics analysis is The Volatility Framework and associated plug-ins. Another powerful one is Memoryze from Mandiant. 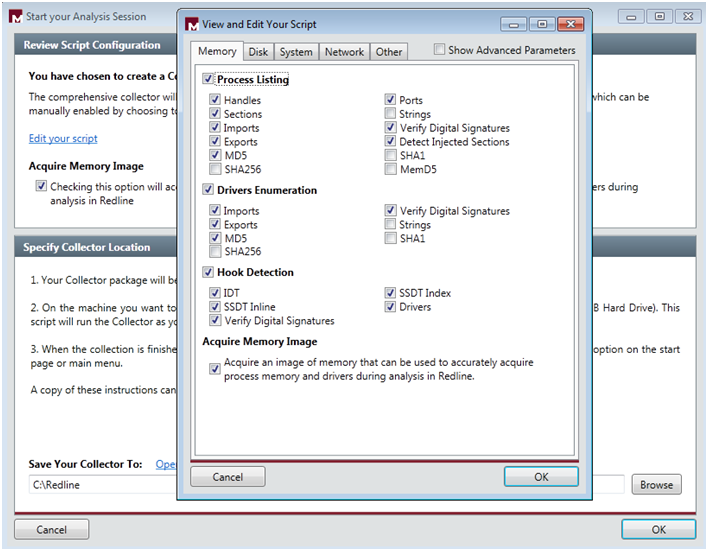 Memoryze version 3.0 was released last July and it supports a variety of operating systems. From the time Memoryze was released, Audit Viewer was the tool of choice to interpret and visualize its output. These two tools have evolved and are blended in Mandiant Redline. Last December, Redline 1.11 was released with support from Windows 8 and 2012. “Redline is a free utility that accelerates the process of triaging hosts suspected of being compromised or infected while supporting in-depth live memory analysis.“. In addition this tool can also help you finding malware trough the use if Indicators of Compromise (IOC) which is a very powerful method and can be used to find threats at host or network level. 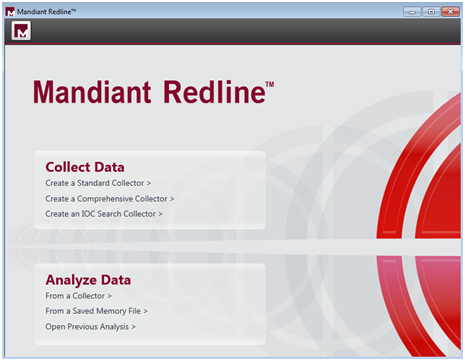 We went through the user guide and according to Mandiant you should install Redline in a pristine system. Mandiant recommends this approach due to inability to assure that your system is secure and free from malware. This way you would ensure the results and the IOC database is not compromised. Further, you don’t create the risk to overwrite or destruct evidence from disk or memory. Mandiant even recommends to run the Redline in a system fully disconnected from the network. That being said, I fire up my VMware workstation and installed a new Windows 7 32bit system. We didn’t fully disconnect the system from the network. We did position it in the Bridge VMnet in order to have access to our home network and be able to access internet to download stuff. We downloaded the tool and ran it. First thing it will say is that Redline requires Microsoft .NET 4. If is not installed it will redirect to the Microsoft .NET installation web page. The installation is quick and simple. Just follow the user guide. When the installation is finished you will be presented a nice web interface like shown below. 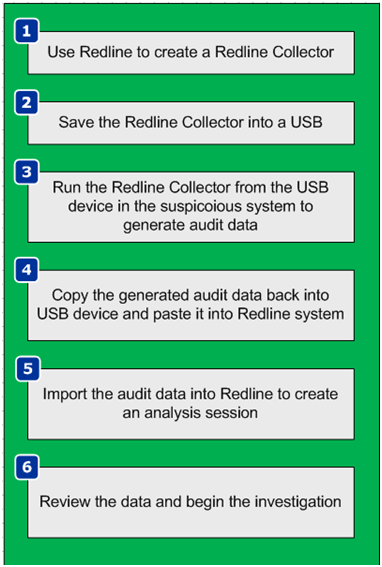 After glimpsing trough the user guide and getting acquainted, Redline has ways that it calls Collectors to acquire data from the suspicious system. 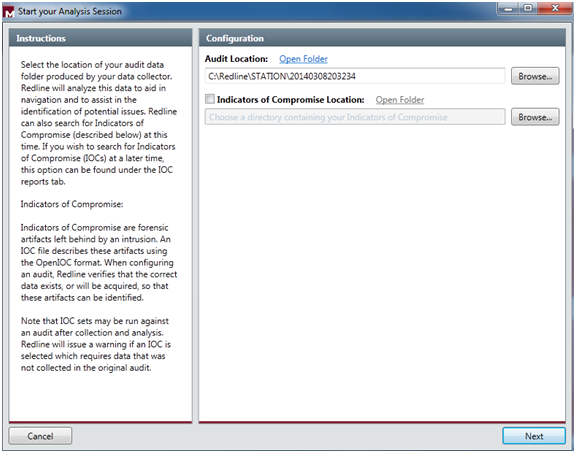 The Standard Collector, Comprehensive Collector and IOC Search collector and the 3 methods supported. We decided to run the Comprehensive Collector to gather the most data out of the system for a full in depth analysis. Each one of the methods is well explained in the user guide. In addition, we further selected to acquire a memory image which is not selected by default. We left the remaining options regarding memory, disk, system and network untouched. We selected a folder and saved the collector settings. We then moved the USB stick back into the Redline system and used the Analyze Data option from the main menu. Then selected From Collector which allows you to load the data into Redline. We selected the folder location of the data and at this stage you can also compare the data with IOC artifacts of your choice. At this stage we will skip the IOCs. Then click next and you select the name for saving your analysis session. It then starts loading all the data and creating the analysis session. I am Reviewing a Triage collection from MSO. I am Investigating a Host Based on a External Investigative Lead. I am Reviewing a Full Live Response or Memory Image. I am Reviewing Web History Data. I Want to search my data with a set of Indicators of Compromise. We will go trough the Investigation Steps in another post. But, It is impressive to see the how easily you can capture a enormous amount of information in an automated fashion. The tool capture the entire file-system structure, the network state, the system memory, the contents of the registry, processes information, event logs, web browser history, service information, etc. The interface is also well designed and provides an interesting workflow (collect, import, investigate) that presents suggested investigative steps that you should take in order to examine the data and look for signs of Evil. As you could see this part is the boring part (collecting and importing). The interesting part (investigation) is to start to get familiar with these live system captures collected from a variety of good an evil systems. Which then allows you to get a sense of what to look and start your investigations and look for threats. This will require practice. Practice these kind of skills, share your experiences, get feedback, repeat the practice, and improve until you are satisfied with your performance.